I know that this is a bag blog but I need advice on a pair of shoes. So the dept stores are having major sales and I’ve been looking for a pair of black tall boots. I found them (and bought them) but I also ended up with another pair of boots. They were on sale (great deal) but after taking them home I’m having second thoughts. I have 30 days to return them. Please tell me what to do!!! I agree. Gosh, I hope that when I get pregnant my feet won’t change so much that my shoes won’t fit. I’ll really cry. Anyway, yes they’re going back. I’ll give them a kiss first. Hey! If you don;t really need them maybe you should give them back. I think they are super gorgeous but if you wear skirts and dresses a lot… I guess you won’t wear them. The only thing that would make me rethink my answer is… are they comfortable? 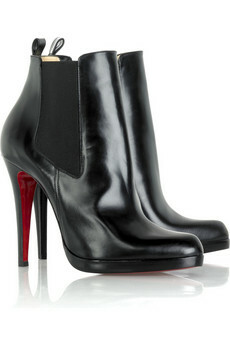 It can be very hard to find a pair of really comfortable high heeled boots! Okay, they’ve been returned. The gay guys at the store were like “OMG, you are returning these? They’re sooo hot!” haha. I said..Please do not make me change my mind! Anyway, I do feel much better now that I’ve returned them. And Li, they weren’t very comfy so I knew I would not be wearing them much.